This intervention involves treating or unblocking narrowings within the coronary vessels. In stable patients the intervention is chosen according to patients symptoms. Cardiac catheterization is initially undertaken to assess the coronary anatomy. Suitability depends mostly on the location of any narrowings. Generally the procedure is used for single and two vessel narrowings. In patients with narrowings in all three main vessels, cardiac surgery with bypass grafts is more commonly used. Narrowings close to where a vessel junction with branch vessels can be more challenging using angioplasty, but not impossible. If the case is thought to be too complicated (which may increase the risk), then cardiac surgery would be preferred. In the earlier days of the procedure, balloon dilatation was the only technique available. In this procedure, a long wire is introduced via the artery at the top of the leg, along the coronary artery and passed across the narrowing. This acts as a type of railway line, so that a tube with a deflated balloon can be guided to straddle the narrowing. This is achieved using X-ray visualisation to guide the tubes. The balloon is inflated to compress and obliterate the narrowing. The balloon is then deflated and all the tubing removed. The main problem with this earlier technique is that the narrowing could recur in about 25% of cases. More recently the technique has been supplanted by stenting. In this procedure, the balloon procedure is carried out as before. However an unexpanded metal stent (coil) is pre-mounted around the balloon. There are two different types of stent. The first is the “bare metal stent”, which only requires a month of clopidogrel to protect the coil. The second type is referred to as “drug eluting”, and needs to be protected with clopidogrel for at least a year. When the balloon is inflated, the stent coil expands and compresses the narrowing. The balloon is then deflated and all tubing and balloon is removed. This leaves the expanded stent straddling the coronary artery where the narrowing once was. The advantage of this technique is that there are far fewer complications with less artery lining tearing, and the re-narrowing rate is reduced to only 8%. Patients often ask whether stents have a “sell by date”. They don’t, unlike bypass surgery. Generally, if there are renarrowing problems after stenting they occur early on, by about six weeks post intervention. Provided concomitant risk factor modification has been followed, renarrowing rates are minimized. However if a patient continues to smoke however, the renarrowing and potential blockage rates can be as high as 50%! This procedure is generally well tolerated and usually takes less than an hour to perform. Patients are mildly sedated but generally awake. Adequate blood thinning is achieved by pre-treating with aspirin and clopidogrel. During the actual procedure, the blood is thinned further. After the procedure, the patient is left with a tiny wound at the top of the leg (in most cases) or at the wrist (if the radial artery of the wrist is chosen instead). Complications occur in roughly 5% of patients. The most common is bruising at the entry site, and often looks worse than it really is. With all the blood thinning, sometimes more significant bleeding with a large lump can occur. Certainly if a lump becomes visible at the entry site, this will require a pressure dressing. Sometimes enough bleeding will require transfusion. A more significant but uncommon complication (less than 2%), usually at the time of the procedure involves the artery tearing along the vessel beyond the stent. 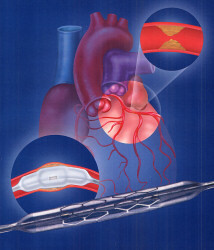 This readily seen and is treated by inserting additional stents. Very rarely the artery can block during the procedure. Slightly more common, in more complicated procedures involving side branches near the stent insertion, a side branch may become blocked and cause a small amount of muscle damage. Overall the mortality of this procedure is low at about 1-2%, but depends on the complexity of the case. The patient is generally kept in overnight, and sent home the next day. If the leg artery was used, it might be sore and should not be overused. Patients should not drive for 48 hours. In uncomplicated cases that were not performed because of a heart attack, patients can return to work within a few days. In patients whose initial presentation was a heart attack, the normal recovery period before going back to work is between 6 weeks to 3 months.